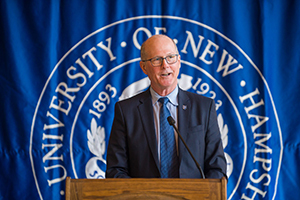 UNH President James W. Dean, Jr. addressed “The Future of UNH: Four Strategic Priorities” on January 24. Watch his speech at unh.edu/future. 08/16/18 - MEDIA ADVISORY: UNH Hosts Demo of Technology to Enable Future Smart and Autonomous Vehicles in N.H.
07/18/18 - UNH Carsey School to Assume Publication of What is New Hampshire?